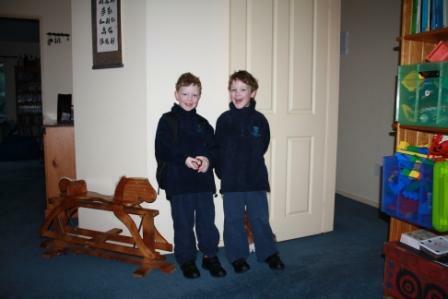 The perils of school for twins – transitioning and managing! Before my boys started school in August last year, I did LOTS of reading about it. What should we do, should they be together or separate, how to best prepare them. And I came down to a few simple things from this, but also from starting the older children at school! Make sure they are familiar with the school grounds and physical layout. By this I mean take them to the school after hours, or take them into a few school events before they go for their first school visit. This helps them to feel lke they belong. We were lucky with this, because their next up brother was still at the same school so we’d been to concerts and BBQs and fun runs, but it definitely helped them to feel like they belonged. Do make sure you take them on their school visits, but don’t worry about how they behave on them! It will bear no reflection on how they are when they actually start school. If they want to cling to your leg, not join in with the songs and are very half hearted with the colouring exercises they are given, don’t worry. By all means encourage them to join in, but remember that this is a whole new thing for them with a room full of strangers. How comfortable are you when faced with a group of new people? Talk really positively about school in the lead up, without making a big deal of it! Let them choose school bags, with a bit of practical assistance and try them on first because sometimes the bags are enormous and the children are small!! Prepare them in advance by letting them make their own lunchboxes for a couple of weeks before school. They can take it with them to daycare or kindergarten, or even if they are at home with you, but get them to work out what they can eat at the different times. This saves them scarfing all their food at morning tea! Arrange a pick up place and make some firm rules and a contingency plan around it. For instance “I will pick you up on the steps in front of your classroom. If I’m not there and you’re worried, go to the office and wait for me there.” I’ve only had one child wander and I nearly died of fright as I found him out on the pavement outside the school. He’d decided he’d come and find me! And it wasn’t because I was late that day either. He wasn’t one of my twins, but I’m sure that accounted for a number of grey hairs! If your child is going into after school care, make sure they know where to go each day, either to wait for a pickup or to the venue onsite. Make sure they have met the people who will be caring for them after school so that they have some comfort in going there. Last but not least, make sure they can put their own shoes on, get themselves dressed and take themselves to the toilet. Write their names on EVERYTHING they will be wearing or taking to school. Get a permanent clothes marker and spend half an hour doing this. They WILL inevitably lose items of clothing and it is much easier trawling through lost property if you know your childrens’ clothes are named. Unless you have a very strong reason for keeping your twins together, let the school decide whether they should be separated or not. Believe it or not, they have educated thousands of children and are able to determine whether they will be better apart or together. A good school will let them start together and will assess over a period of time. However, if the school has a strict policy that they apply to every set of twins, I would question it strongly! !Don’t panic!! Relax, take a deep breath and trust that the school knows what they are doing. A note here that my boys started out in the same classroom, but after 6 weeks, they were split up. The class size had got too big and they were making a new class of new entrants. Conal was very keen to work and coping well with the classroom rules, so they left him in with the older, more capable children. Zac was having more of a struggle, and had formed a strong bond with the teacher, so she kept him, and used him to help look after the little children who had just started. He was given a position of responsibility by being the messenger and this curbed his distractable tendencies beautifully. If you have any concerns that your child may have behavioural issues or learning difficulties, have them assessed before they go to school. It’s better to have the support systems in place before they start school rather than after they’ve been struggling. The same goes for hearing and eyesight tests. Do talk to the class teacher regularly. New entrants’ teachers are used to dealing with anxious parents and are happy to spend a couple of minutes telling you your little darlings have been OK! Do give the teacher a couple of pointers as to differences between the twins, especially if they are identical! Even if they’re not, it’s useful for the teacher to know how to approach them. I advised the boys’ teacher to keep Zach busy and she’d be fine! I was a little concerned when after 6 weeks, the assistant teacher in the classroom asked what their personality differences were, but then they’d had 10 children start within a few days of each other, so I guess they’d all got jumbled up. My boys are now in their third term of school. They’re still in separate classes. One is reading and writing at a higher level than the other, one is writing more neatly. One is doing very well in terms of not being distracted (in a class of 16, 5 year old boys, this is an impressive feat). One is doing well with managing himself and staying on task better. One has endeared himself to the occasionally grumpy deputy principal by making her a thank you card. The main thing for me? That the school has treated them like the individuals they are. They have taken their needs into consideration and taken time to fit them to teachers who will suit them. Interestingly, one of my boys has a set of twins in his class and they have kept them together. So they have no one size fits all policy, which I think really as a parent of twins, that is all you can ask. To me the clincher is that they love going to school each day, they are positive about their experiences there and are happy. I can’t ask for more.